In part one of this series we started learning how to make maps rendered by WebGL, a browser based hardware-accelerated graphics API for 2D and 3D graphics. Our access to this technology was via Tangram, a map rendering library from Mapzen. This post will focus primarily on shaders, those perplexing parallel programs that power our pixels, and how to create visual effects using them. We will be focusing on 2D effects for now and will also look a bit at how to create interactive effects that are powered by shaders. If you haven’t read part one, you might want to start there. Shaders are the not-so-secret sauce to creating hardware-accelerated performant real-time visual effects. They are programs, written in a c-like language called GLSL, that are used to compute the final color of a pixel on the screen. They make your graphics card’s rendering pipeline programmable. There are two kinds of shaders, vertex shaders, which act on points of geometry; and fragment shaders, which operate on pixels (or fragments in WebGL speak). What makes them fast, and also difficult to write, is that the shader program is run for every pixel (or vertex) being rendered in parallel. However running in parallel means that each pixel doesn’t really know what’s going on with the other pixels. We are used to being able to write loops to look at regions of the canvas and treat them as groups of related pixels; but in a shader program there is a sense that the whole world is just that pixel currently being processed. They are the Lilliput of graphics APIs: tiny, self contained and a bit oblivious to what is going on in the world around them. The other thing that makes them fast is they run on specialized hardware, the GPU or graphics processing unit on your computer. However, this means that they are separated from the CPU and memory that we usually program with. Thus once running they are a bit harder to interact with than we might be used to. Vertex Shaders: These are given the geometry being rendered (lets say a polygon or a cube) and can change the coordinates of points (vertices) that make up the geometry. This can be used to transform, scale, or otherwise mutate a shape. Fragment Shaders: These are given the fragments (pixels) that are going to be rendered to the screen for each piece of geometry. The fragment shader’s job is to assign a color to this pixel. You can do this in multiple passes to create effects such as light, shadow and material properties. This is the shader type we will focus on in this post. So how can we take advantage of shaders in Tangram? A lot of Tangram’s built in rendering is built on shaders and the library allows us to tap into its rendering pipeline at various points. The diagram below, from the shaders overview for Tangram, demonstrates where we can jump in. // Get the coordinate of this pixel and normalize it to the 0-1 range. // The color variable represents the color that this pixel takes. // y coordinate to the green channel. Set blue to 0. We’ll apply this style to the water layer and draw the earth layer in a solid color like this. What can we tell from this image? If we look in the lower left corner we see it is pretty dark. This is where both the red and green channel gets assigned a zero value. The bottom right is where the x-coordinate is greatest and the y-coordinate is still zero, resulting in a pure red. The top left is pure green suggesting the y-coordinate is 1 and the x-coordinate is zero; and finally yellow is where red and green combine. Unlike the coordinate system in the 2D canvas API, the Y axis starts at the bottom and grows upwards (like regular cartesian coordinates). // In this case we were not using pure blue before. Using this technique and experimenting with the values in the conditional helps us confirm that gl_FragCoord does indeed run from 0 to the size of the window in each dimension. So after that quick introduction, let’s get to the heart of the matter, making visual effects using shaders. We are going to focus on 2D effects and are going to take inspiration from a blog post by John Nelson called Firefly Cartography. In it John describes a 3 step technique to make highly stylized thematic maps with dark moody backgrounds and a bright glowing data layer. He has some thoughts on what makes these maps visually appealing, and we are going to try and replicate (partially) that in Tangram. Our end result will look like this. Its not quite as polished as John Nelson’s Firefly maps, but it seems a decent start. The first step is creating the underlying desaturated base map to show the land. For this we will use a raster based terrain layer created by Stamen, and run image processing on it in real time a shader. The terrain layer actually looks like this. This part doesn’t use shaders, so I won’t go into much details (also I skipped the vignette ? ). 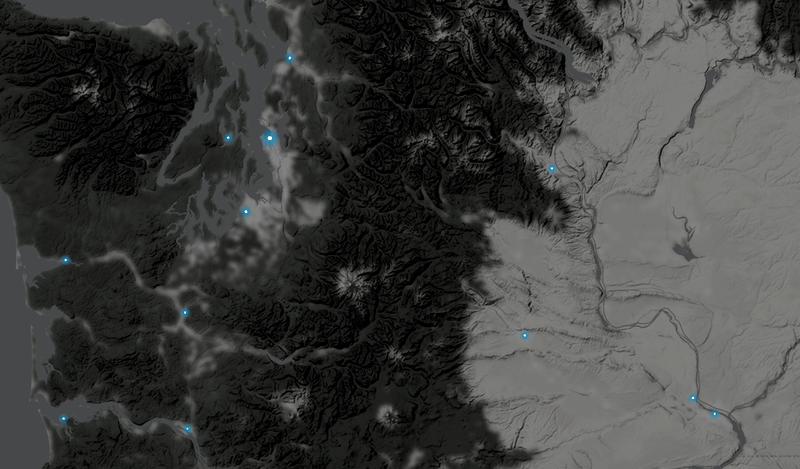 In brief I loaded the country polygons we used in the last blog post and drew them on top of the basemap. I then used a filter to to make the polygon for the USA transparent while leaving all others a dark translucent black. If you are trying to do something like this, make sure to set the blend-mode of this layer to inlay . Step 3: Single bright, glowing thematic layer. I didn’t have any data in mind for this experiment, so we will plot the cities and populated places that come from OpenStreetMap. We’ll also adjust the size of the dots to roughly represent population. Lets see what the plain, pre-shader, dots look like. Not bad, but not glowing. Here is the code for our shader to add simple glow effect. I did my best to follow the description of how to create a glow from John’s article. // We are going to use texture coordinates to color our dots. // What does texcoord look like? // v_texcoord is a _varying_ set by tangram. // the default point shader. Lets discuss the shader a bit. We are running the shader each piece of geometry in this layer, that is, for each circle that is visible. The shader will run for each pixel in each circle. To find our where the current pixel is we use v_texcoord . This is a coordinate in texture space. A texture is how images are manipulated in WebGL, and you can imagine the texture space as being the space of a square image covering the bounding box of our circle. v_texcoord is a variable created by Tangram itself with the coordinate for the current pixel in that texture space for this geometry. To create our glowing circle we set the alpha of the pixel based on the distance from the center of the texture space, closer points are opaque and further points are transparent, resulting in a circle. We also make a small opaque white circle in the middle of it all. And there it is! Budget firefly cartography—on the fly! Note that this is a fully interactive slippy map, and as you pan and zoom, different cities will show up based on the zoom level. So one appeal of doing effects like this in this way is that they run in real time, and while the map above demonstrates that by being pan-able and zoom-able we could push this forward a bit by exploring animation and interaction. Lets take a small peek into what’s involved in doing this. How to tell the shader where the mouse is? How to figure out which dots are close to the mouse? How to change change the color based on that informtion? To do the first we are going to have to put on our uniforms. A uniform is a way to describe a variable that we can give to the shader program once its running. It’s called a uniform because it will have the same value for each pixel/fragment that the shader is processing. To do this in Tangram we add a new block to our shader style. // directly and then redraw. Then we can set the pixel color based on distance to the mouse. To make it pulse we need to adjust the size of the whole thing over time. We’ll use a shaping function based on the sin function to do this. Instead of our previous block of code, we can use the following to achieve this. // oscillation using the sin function with some offsets to control its size. // we use our pulse value to grow and shrink the whole dot over time. If you look carefully at the gif above you will see the orange dot pulsing slowly! You can also see this live here. If you look closely you will notice that this is not a true ‘selection’. If we have the mouse in the right place, only part of the dot will be orange and glow. This is because we are doing this all one pixel at a time, without any real model of the overall geometry (we are in Lilliput remember). If I were trying to make a true selection I would use the Click API tangram provides combined with the techniques in this post (such as setting a uniform to store where we clicked) to achieve that, i’d also set the color in a more data driven way, similar to how the size of each point is set. There we are, an introduction to shader effects in Tangram. My observation is that shaders make traditional image processing techniques (such as saturation and brightness adjustment) quite straightforward. However more thought (and math) is needed to do things that are geometric in nature (though it should be remembered that modifying actual geometry is best done in a vertex shader which we haven’t covered here) . The power is there though, as can be seen if you take some time to browse advanced shader galleries, or even the advanced Tangram examples. Another couple of resources I wanted to mention in closing are Tangram Blocks and stack.gl/glslify. These are both repositories of small chunks of shader code that provide common utilities you might find handy. As you may be able to guess from the name, Tangram Blocks provide for direct integration with Tangram based map. Here is the link to a live version of the final result with full source code.